Pimm’s is currently available in varieties numbered 1, 3 and 6. The intermediate numbers have been banned as the last time they were consumed there was so much patriotism we collectively woke up with both a massive hangover and an intercontinental empire. By the way, there’s a wedding on this Friday, had you heard? I’ve always wanted a reason to travel to London and wave a flag around. I finally have one. Pimm’s 6 is still available? I knew about 1 and 3, but, right, time to get hunting! So I’ve gotta ask: as British people, do you really care about this whole marriage thing? My American perspective sees is as a desperate attempt revitalize a dying position that now has virtually no power, and why the hell is American ‘news’ so obsessed with it? 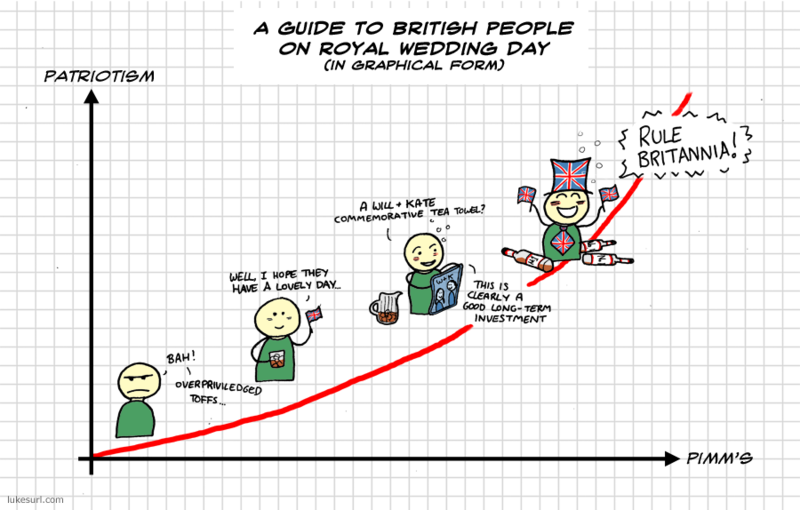 As a British person, I can say that I personally don’t care about the wedding at all, and am glad it will soon be over. It seems my immediate family feels the same way too. However, judging from my neighbours, it seems some people are, for reasons I am completely unable to understand, very interested in the wedding, and see it as a time for joyous celebration. Ah, not just me then. I’m in fact on the -y axis somewhere. Mmm, the graph spells out my perspective pretty well. I wasn’t hostile to the event, rather just indifferent. However I had the day off and next door were throwing a party, it was a lot more fun to just join in. Fun fact: April 29 is the anniversary of Hitler’s wedding. Which ended in double suicide less than 40 hours later. What a cute little character!